After an eventful day of falling down my stairs and putting on a cooking demonstration at the Bolton Farmers’ Market, I needed a glass of wine. A quick look and some contemplation in the cellar as to what wine would suit the mood. 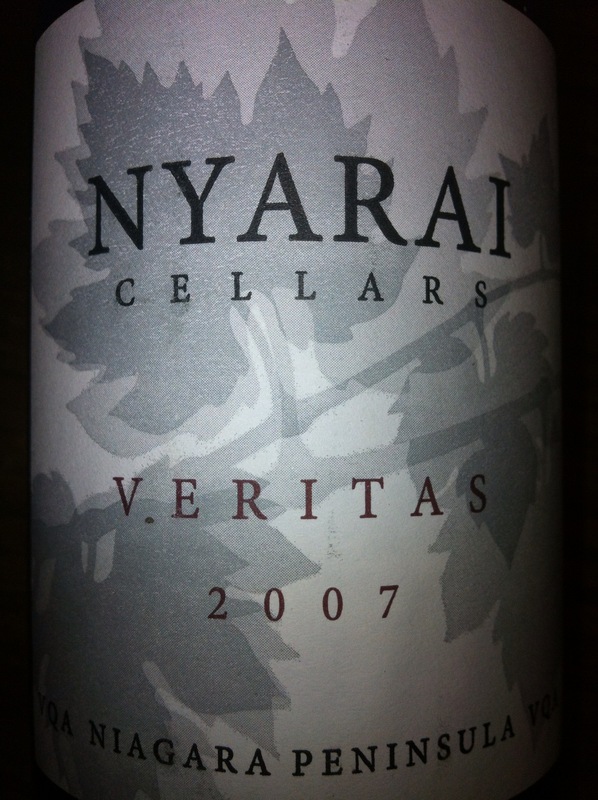 My choice was the 2007 Nyarai Cellars Vertitas VQA Niagara Peninsula VQA. The twist-off closure seemed appropriate for the setting. Blend of Cabernet Franc, Cabernet Sauvignon, Merlot and Syrah. Vibrant colour of ruby red with a garnet brick rim. Wonderful nose of perfumed flowers (think sugared violets), pleasant medicinal hint, granite stoniness, inky black berries. The palate is refined elegance with multiple layers of flavours – white pepper, gentle spiciness, over-ripe raspberries, red plum and integrated fine tannins. With time the nose evolved to mushrooms and cherries and the flavours of smoked meats and peppered cherry jam emerged. The truth is that this wine is outstanding, drinking perfectly now, I feel that I opened it at the exact right moment. Multi-dimensional – sweet (but dry), spicy, savoury – a wine like fine barbeque.